Palestinians reaped what they sowed in 2014. Bloodthirsty war-loving Palestinians stubbornly continued to fire rockets into Israel. 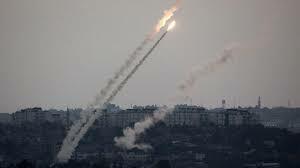 The governing Hamas refused to restrain the depraved Israel-hating militants who were attacking Israel again and again; therefore, Hamas is directly responsible for the death and destruction that followed. Did you hear what I said? 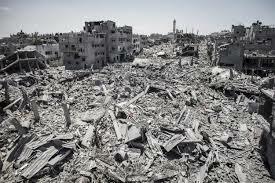 Hamas is 100% to blame for the destruction of Gaza, NOT Israel. Fact #1 : In 2005 Israel withdrew from Gaza and handed it over to the Palestinian leadership. One would think, that normal people would be grateful for such an incredibly generous gift, but not the Palestinians. 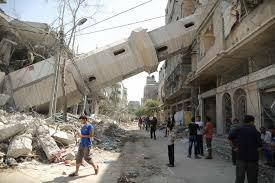 Fact #2 : Since 2005, Gaza has been increasingly used as a launching-pad for violent attacks against Israel. I am not saying that all Palestinians are bad people. There are those who desire peace; however, this does not change the fact, that the Gazan Palestinians refuse to live in peace alongside Israel. Israel traded land for peace, but instead of receiving peace, they were rewarded with more violence. Hamas purposefully placed military installations among women, children, the UN, schools, hospitals, etc. in an effort to keep Israel from destroying them. They figured that if Israel did attack these active military installations, then the Palestinians could accuse Israel of killing innocent civilians. The Palestinians’ evil plot was obviously hatched in hell. I would have done the same thing Israel did. If someone would launch an attack against me and my loved ones, I would seek to destroy the source of the gunfire. I would not consider it to be my responsibility to hold fire to prevent collateral damage. I would consider it to be my responsibility to stop the gunfire from killing my loved ones. Furthermore, I would not knowingly put my wife and children in danger the way the Palestinians did. I love my family more than that. The Palestinians do not love their families the way that Americans and Israelis love their families. The Palestinians plan was to kill as many Israelis as possible; but instead, they brought about the destruction of much of Gaza. They reaped what they sowed. They deserved the devastation that they received. It is difficult to feel sorry for their plight in light of the facts. Hatred and bitterness are harsh taskmasters. For as long as the Palestinians sow hatred, bitterness, conflict, violence and war, that is how long they will reap death and destruction.